I have the opportunity to buy two stands with mills machines. I feel comfortable on the value of the machines. But I am not sure about the stands. The stands have been painted once. But come with all the keys and the bar to lock in the slot and are not rusted and in working order. I looked at them last fall and now he is asking if I am interested. Last edited by montanaslots on Sat Jul 21, 2018 7:41 pm, edited 1 time in total. Thank you all for the replies. It really helps when you come upon the unusual. I will keep you posted. Thanks to who put in the work!!! Bought the stand and he had another which was complete but without keys. I paid 100.00 for it. Any thoughts on how to get keys either made or purchased? 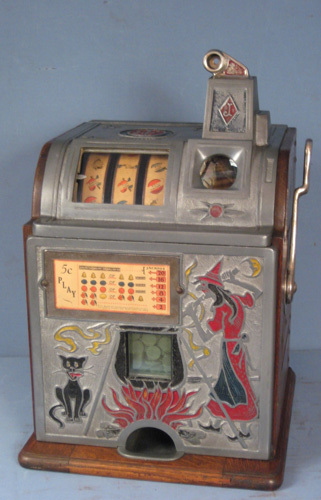 Also he has an all original Jennings sun chief tic tax toe for sale for 1500 firm. I don’t know if that is a good price or not. I think I have attached a pic.